The course is suitable for support staff who need a broad awareness and understanding of composites in terms of processes and terminology used, typically quality, sales, purchasing, HR and administration roles. I am new to composites and your courses seem very technical, are they suitable for me? Why should we choose DMC over other courses? Why don't you offer 1 or 2 day courses? This course is suitable for support staff looking for a broad awareness and understanding of composites in terms of processes and the terminology used, including quality, sales, purchasing, HR and administration roles. We cover approximately 28 hours of practical throughout the week. 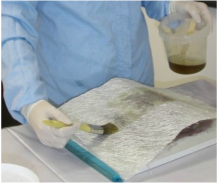 We will introduce you to the three most commonly used manual processes within the composites industry. You will get to see first-hand what is involved when producing components from wet lay-up, infusion and pre-preg processes. Through theory, technical demonstrations and practical sessions you will get an appreciation of composites processing. You will gain an insight into terminology, materials and equipment used by producing your own composite parts. The course starts with wet lay-up laminating, teaching you basic resin calculations, before moving onto safe dispensing and mixing of the gel coats and resins. The gel coat is painted onto the mould, followed by wetting out and consolidation of the chop strand mat, with brushes and rollers. Time will be spent on getting good consistency and consolidation of the lay-up with guidance from the course tutor. For the pre-preg laminating task you will produce a part using carbon fibre and a core material. We start with material identification looking at the range of fibres and fabrics that are most commonly used; carbon, glass, aramid and polypropylene fibres and plain twill and satin weaves. From here we move onto material preparation which includes storage and defrosting, templating, nesting, kit cutting and ply orientation. Sandwich structures are introduced, highlighting their benefits, handling and preparation. A wide range of core materials are looked at, concentrating on cores commonly used with pre-preg, including foam, syntactic, nomex and aluminium honeycomb core. Resin infusion is split into two categories – flow infusion and film infusion. 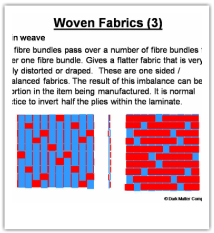 Using the flow infusion method first, (working with bonded, stitched or woven fabrics) you will produce a trial panel. Then we will show you how the information from the trial panel can be used to produce an infusion strategy. With the flow infusion process you will be working with a variety of external infusion media and surface bagging your components. The film infusion method will be demonstrated so that the differences within the infusion process can be clearly seen. This course will take you through producing your own mould, including post curing and mould preparation, to manufacturing a high quality component using carbon fibre, envelope bagging and autoclave curing. You will have a sound understanding of the composite processes available and be able to communicate with suppliers and team members confidently.